For the Reconstruction of the Spirituality of America. New York, NY. Publisher: Survival Foundation, Inc.. Editor: Frederick Bligh Bond. 1/1, August 1935. 72 pp., $5.00 a year; $10.00 a year entitled the subscriber to the journal and to membership in the Foundation. The journal announced its purpose as the affirmation and explication of the limited idea of "survival": "SURVIVAL is the word chosen to imply the truth that all that is essentially YOU—your Self, your Mind, your Treasury of Memory and acquired Personality—in short, your Character and all that makes you an Individual—survive the loss of the Body and continue in a state of greater activity and freedom." In reality, it seems to have been yet another attempt to interest the American public in psychical research, and suffered the common fate of such ventures. Bond (1864-1945), a transplanted British architect and Old Catholic Bishop, also edited the Journal of the American Society for Psychical Science, and Psychic Science. On him, see the note under Journal of the American Society for Psychical Research. 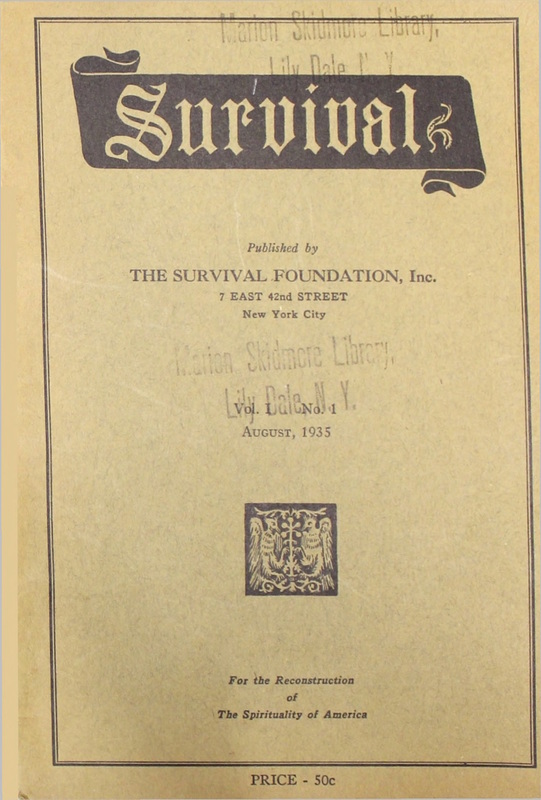 Membership and privileges in the Survival Foundation were to be had for $10.00. LOC; University of Texas, Austin; 1/1, August 1935, Skidmore, Lily Dale; 1/2 University of London.